Think before you take | Do the twisted. Sir, do you really need all those napkins? M’am, are you sure 50 packets of ketchup is enough for your small fry? You know the hoarders. The people who take ridiculous amounts of unnecessary packaging to accompany their to-go or take out meal. And what happens? They use one napkin and throw the rest of the stack away. 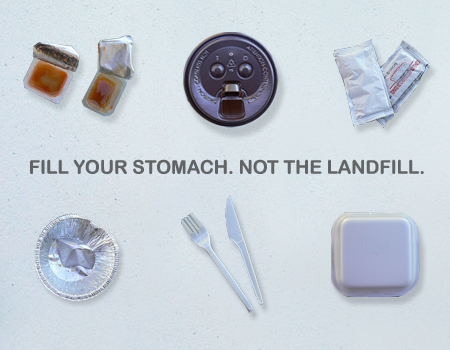 Meet TakeOutWithOut, an inspiring and passionate campaign encouraging people to say no to the forks, spoons, napkins, boxes, and bags that restaurants provide. Restaurants don’t really have a choice. They’re supposed to make sure you have all the essentials to enjoy your meal. Unfortunately, those “essentials” end up in the landfill for-ev-er. It all starts with you. If you know there is a pretty good chance you are going to throw them away, simply say no thanks. Pick up some reusables. Be more conscious of your decisions. Any small action is a step in the right direction. For you, and for our planet.